J.D. Andrew of The Boxmasters recently spoke with Music Recall Magazine. Check out MRM’s exclusive interview with Andrew below. See The Boxmasters this Friday, September 11 in Newberry, SC at the Newberry Opera House. Tickets are still available and can be purchased HERE! MRM: Who were your musical influences growing up? Andrew: My first, first musical love was the Beach Boys. I had one of those little Fisher Price turntables. And I listened to the early Beach Boys records continuously. And as a little bitty kid I listened to their surf records and didn’t quite understand when they got to “Pet Sounds” and stuff like that as much. I loved the Beach Boys and other beachy sounding records. Also, the Chipmunks were big for me. Not long after that, The Beatles. I never listened to the music of my time. I was always kinda like 10 years behind. I would listen to a lot of the older music that was from the previous generation versus what my friends were listening to. It’s always been that way. I just love the classics and stuff from the golden era of rock and roll – the ‘60s and early ‘70s. And because of that I started playing a little bit. MRM: How did you end up becoming a sound engineer? Andrew: I always loved the technical aspects of setting up equipment and putting on a show. And that’s why I gravitated towards the recording engineer aspect of making records and all of that. 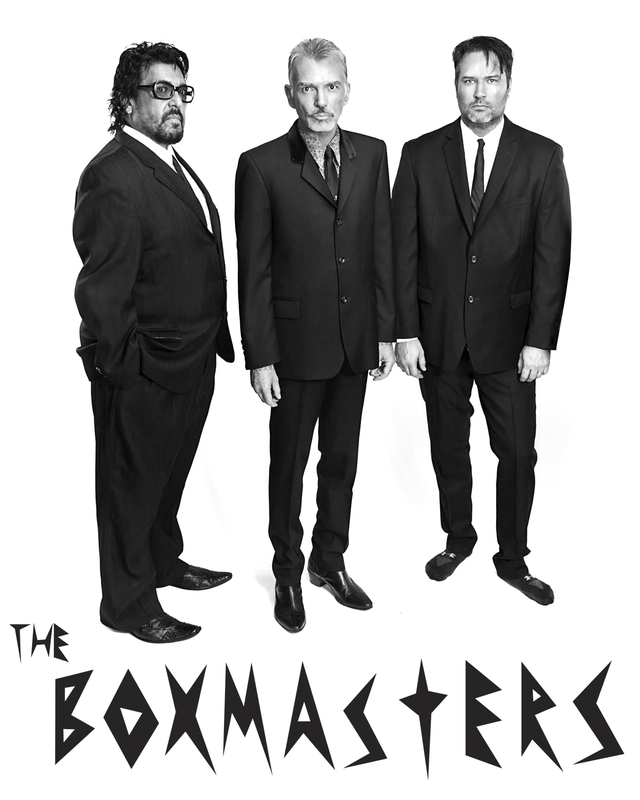 MRM: How did you get involved in the Boxmasters project with Billy Bob Thornton? Andrew: My career has mostly been a recording engineer until I met Billy (Bob Thornton) in December 2006. And we started working on his solo record, which was called “Beautiful Door.” And after a couple weeks of doing that, he came down and asked me how well I played guitar because he needed to record a song for a Canadian TV show. And none of the other band members were in town. It was a cover of “Lost Highway” by Hank Williams. And the sound we had was just something – something was that just sparked our imagination about what we could do. So we started into what would become The Boxmasters. We went crazy with our mad hybrid of British invasion and late ‘50s kind of hillbilly music. And we did that kind of wild combination after a while. But after the years went on and with this new record “Somewhere Down The Road,” we kind of developed into more of just a jangly rock and roll band where it’s just a lot more natural sound of how we play. And a lot more accessible to people because it’s not as wildly stylized as our earlier stuff. MRM: How was your guitar playing in the beginning? How has it progressed? Andrew: I wasn’t concentrating on playing guitar or anything at that point. I was just a recording engineer, and I had played a lot in college. When I got to Nashville, my initial intent was to play the singer-songwriter kind of route. I played one time at the Bluebird (Café). It was one of those things where I had my two songs I could play, and I broke a string. They heard me singing so loud that they turned off the speakers. And when I got done with it, all could I hear were crickets. And I was like this is not very fun. And I was already working somewhat as an engineer and had a job in the business. I was like I’m gonna concentrate on that. And so then I kind of just played on and off – I wasn’t really concentration on it. It wasn’t really until I met up with Billy that I was like “oh I really have to work on my playing.” And the big thing is that we basically recorded every single day for the past five or six years, either in the studio of live. So I had a lot of on the job training. As we have gone on, I’ve gotten better. We’ve gotten better as songwriters – better all around as musicians. It’s never really taken much for a spark to come to us to start a song. We have a tremendous back catalog of things that have yet to come out. MRM: Can you tell us about the new music that The Boxmasters have out? Andrew: We did just a release, aside from “Somewhere Down The Road” in April that came out. We just put up a record on our website called “Providence” – about two weeks ago. It has some of the songs that we have in our set. A few people have asked about them – the songs we play in the shows. So it just made sense that we put that record out and make it available to the fans at a cheaper price. So hopefully they will check it out. We want to make it available because we are recording more stuff and want to get it out there. MRM: You’re a Grammy winner? Andrew: Yeah. I got the certificate; I didn’t get the actual statue because I only worked on a few songs. It was for Kanye West’s first record back when I just worked on whatever came my way. MRM: How was it working with The Rolling Stones? Andrew: It was for the “ A Bigger Bang” record. I got to work on that record for about a month and a half. I got to work with both Mick (Jagger) and Keith (Richards). I didn’t get to work with Ronnie (Wood) or Charlie (Watts) because they had finished the basic tracking of the record. I got to sit there – and in-between listening to stories from those guys – made a record. It was amazing. MRM: Do you have any crazy road stories with The Boxmasters? Andrew: We’re not teenagers anymore. So our crazy road stories are like making our new drummer try to eat the 72oz steak at The Big Texan in Amarillo or just bowling or something like that. We’re all old and have kids. We don’t get into too many crazy story type of things. It’s mostly a lot of work being on the road. MRM: A lot of work? What is a typical day like? Andrew: We get up early in the morning and do some radio and/or TV interviews in the morning and talk to some more folks like you. We get to the gig and unload the trailer, sound check, take a shower, do the show and do it all over the next day. It’s a lot of work these days being a band on the road. It’s so expensive. You can only take so many people on the bus. You have to do two, three, four, five jobs along with just being a guy that plays guitar. A lot less of having a good time as much as really hard work. MRM: What is the ultimate goal with The Boxmasters? Andrew: We’re really pleased with the places we play for the most part. We like playing places where the people are standing up and having a good time. So the theaters where the chairs are too comfortable and people sit there and get a little too relaxed makes us – as a rock and roll band you want people along with you getting their energy, and we’ll give it back to them. It’s kind of mutual admiration. We want people to be involved in the show with us. As long as we’re out playing for people who appreciate us, that’s good enough for us. We know we’re never going to be a band like our heroes because that doesn’t really exist in this day and age. So we’re happy to be able to make records because the creative part of this band is really what keeps us going. MRM: What can fans expect when The Boxmasters roll into town on Friday, September 11 at the historic Newberry Opera House in Newberry, SC? Andrew: First off, we are a rock and roll band. Some of our previous stuff had a lot more country and hillbilly rhythm. We are a rock and roll band. We come out and put on a rock and roll show. I’m sure that in the theater, we’ll put on our suits and stuff and look more like a British invasion band – except in hot, sweaty clubs. Billy tells a lot of stories about the songs and where they came from. There’s a lot of interaction with the crowd. We’ve got some incredible musicians in our band. They can really expect a top flight rock and roll show.